The WFEF collaborated with Coal Township, the U.S. Fish and Wildlife Service, and the Pennsylvania Department of Environmental Protection to complete a stream and wetlands restoration project on mined land in Northumberland County. 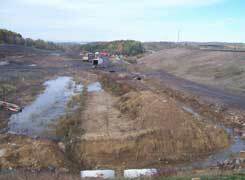 The site is located between Shamokin and Kulpmont south of Route 61 adjacent to the Rinehart Food Center. 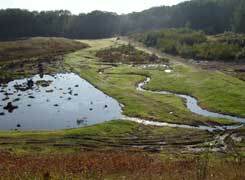 More than 2,000 feet of stream were restored and more than three acres of wetlands were created. The site had been extensively disturbed by past mining and industrial activity. The Fish and Wildlife Service designed the project and supervised contractors in the actual construction of the project. The Pennsylvania Department of Environmental Protection, Bureau of Abandoned Mine Lands, provided funding to Coal Township to restore the land and the Wildlife for Everyone Foundation provided financial management services. The Foundation will hold a portion of the funds for five years to be used in the event that any remedial work in necessary. The project was undertaken at the request of Coal Township. The project provided an excellent opportunity for the Fish and Wildlife Service to demonstrate habitat restoration techniques on heavily disturbed land. This was a good fit for the Foundation because one of the Foundation's major focus areas is habitat restoration. Dr. Thomas Ballestero, a civil engineer with the University of New Hampshire, designed the stream and wetlands using natural channel design methods to calculate the proper dimensions and slope for the new channel. 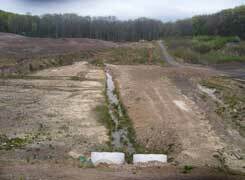 The new constructed channel mimics the form and function of a naturally stable stream in the region. The wetlands were designed to take advantage of the site topography and drainage and to control runoff from the adjacent industrial development and mined land. The planting plan was developed by Kelly Williams, a Wildlife and Fisheries Science student from Penn State, incorporating a variety of native plants. The wetlands have been designed to have fluctuating water levels to promote a wide variety of plant life. Additional plantings will be completed in the spring of 2007. Dave Putnam, a wildlife biologist with the Fish and Wildlife Service, worked on all phases of the project. 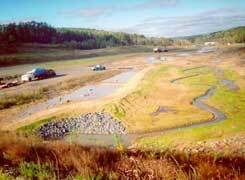 The following photos, provided by the US Fish and Wildlife Service, show before and after views of the project.